Positioned within an exclusive Bulli enclave, this architecturally designed residence raises the benchmark in luxury coastal living. Arguably one of the largest and finest homes on the coast, this residence showcases grand interiors and state-of-the-art finishes which will appeal to the discerning buyer seeking exceptional quality and location. Nestled in a premier estate, this outstanding home stands in a prestigious street surrounded by other high caliber homes. 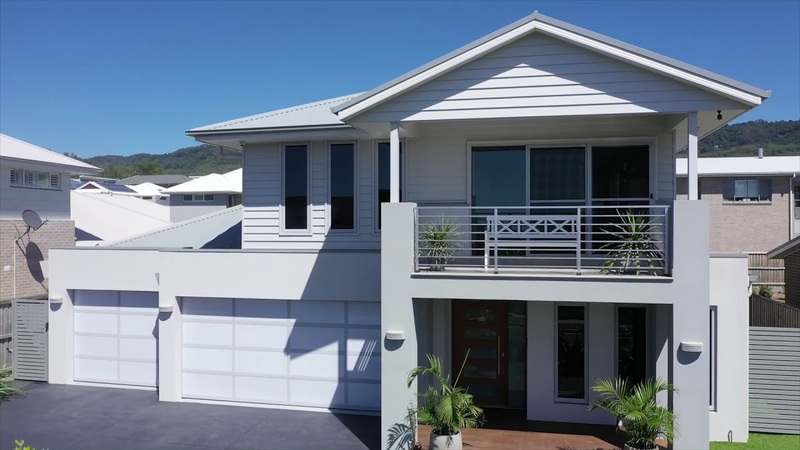 A private walkway down the road connects the estate to the beach providing quick access to the pristine sands – you will be hitting those waves along beautiful Bulli Beach and Sandon Point in next to no time. Positioned between Thirroul and Bulli, you can enjoy the finest amenities that both townships have to offer including trendy cafes, transport links, restaurants and boutique shops. Highly regarded schools are close by as well as plenty of parks and reserves in this family-friendly community. The commute to work is a breeze with easy access to the highway, taking you into Sydney in approximately 90 minutes and Wollongong in approximately 25 minutes. Proudly presenting a stately street frontage, the grandeur continues once inside this impressive home. A residence of epic proportions, there is room to accommodate even the largest of families in this spacious home which exhibits indulgence and elegance at every turn. Sprawled across 2 levels of generous living space, a beautiful portico and entryway welcome you into the home where on the lower level you will find a spacious sitting room, dining and family room. An exquisite kitchen awaits brimming with high-end inclusions such as stone bench tops, premium appliances, custom wine rack, and a massive butler's pantry. Also located on this floor is the second bedroom accommodating your long-term guests in style with its own ensuite and walk-in robe. Outside, an entertainer's deck will allow you to host sensational parties and gatherings all year round equipped with custom cabinetry, outdoor sink, ceiling fans and a brand new 4m swim spa. A stunning staircase leads to the second level where a master suite adjoins a private retreat which flows to the front balcony. From here, you can admire the breathtaking ocean views before winding down for the night. Palatial in size, the master suite also features a hotel-like ensuite with his and hers sinks and a huge walk-in robe. And while you're relaxing in the private retreat, the kids will love hanging out watching TV in the leisure room equipped with a kitchenette – handy for storing the movie snacks! Boasting spectacular escarpment views, the 2 remaining bedrooms on this level both feature walk-in robes and are serviced by another resort-style bathroom. Surrounded by lush, low-maintenance gardens, a 3 car garage integrates with a secondary 2 car tandem garage and study. This amazing space is a versatile offering which could be used for a home gym, office, workshop. Only discerning buyers seeking luxury, space and style should inspect this flawlessly designed home that embodies the relaxed beachside lifestyle. Masterfully built with all the extra's, this home is a showpiece you will be proud to call home. Moments to all the regions fabulous amenities and with the beach just a short walk away – a modern coastal lifestyle awaits. Call now to arrange your private inspection today.